marble, that magnificent, soft, all-natural stone that is known for its stunning aesthetics, requires a particular type of cleaning and care. If you're lucky enough to have marble countertops in your home, you're going to want to know exactly how to clean and maintain them. One of the easiest ways to keep your countertops clean is to take the steps to prevent spills and stains before they happen. All you really need to clean your marble countertops is a soft cloth or sponge, warm water, a non-abrasive, high-end cleaning agent and chamois. Mix your cleaning agent with the water, wipe down the countertops and then buff clean with the chamois. One of the easiest ways to make sure the magnificence of your marble is readily apparent is to polish it. You can use a simple chamois dipped in water or a combination of baking soda and chalk. Generic cleaning products cost less and claim to work as well as their higher-end counterparts. Don't use them. Many contain acids and alkalis that will scratch and degrade your countertops. Some will say that you can use vinegar, bleach and ammonia to clean your marble countertops. General-purpose cleaning products can wear down your countertops, permanently damage them and dull their shines. 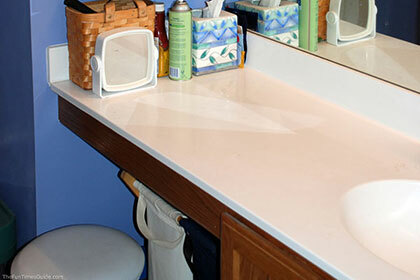 Abrasive agents and scouring pads can leave your countertops scratched. Keeping your countertops clean isn't a matter of luck. It takes the right tools and knowledge. To learn more about keeping your countertops clean, contact us now.